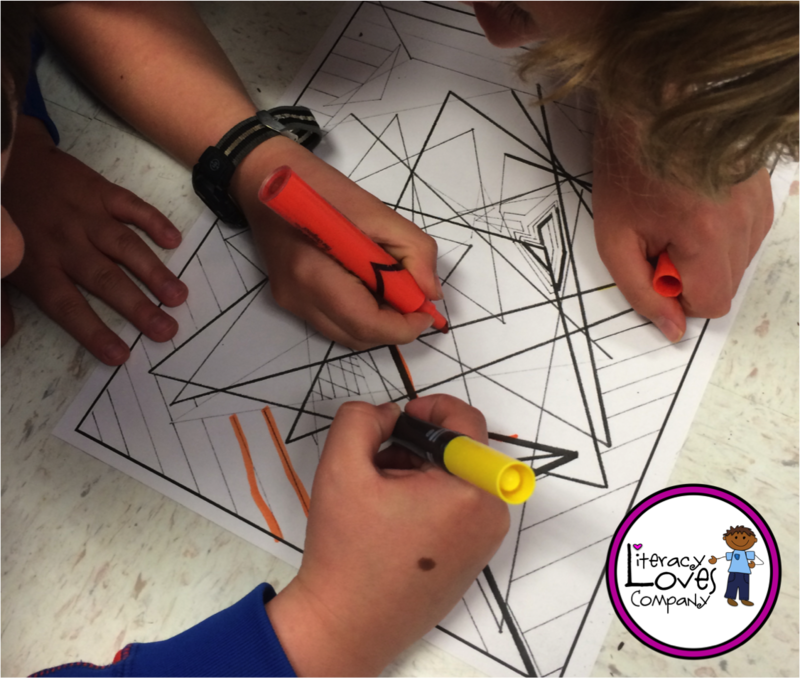 Literacy Loves Company: Make Math FUN! 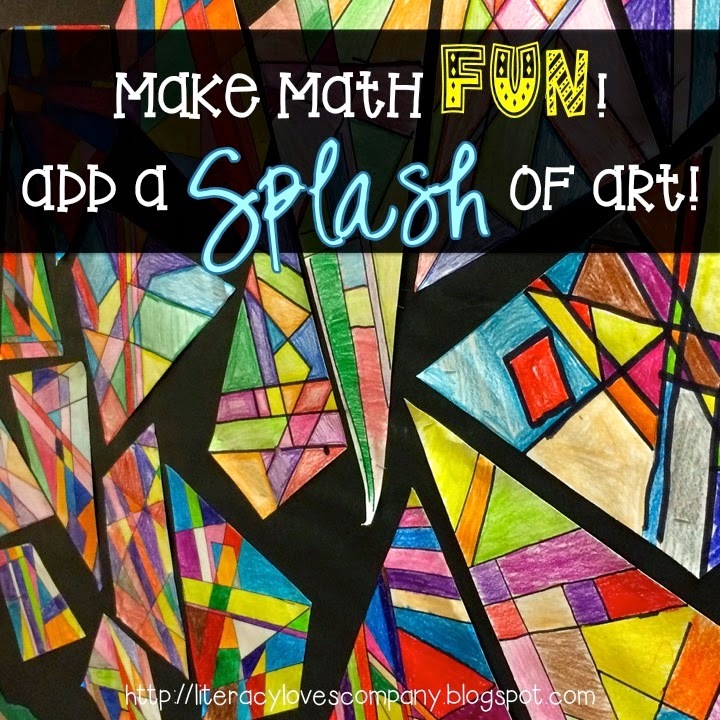 Add a Splash of Art! 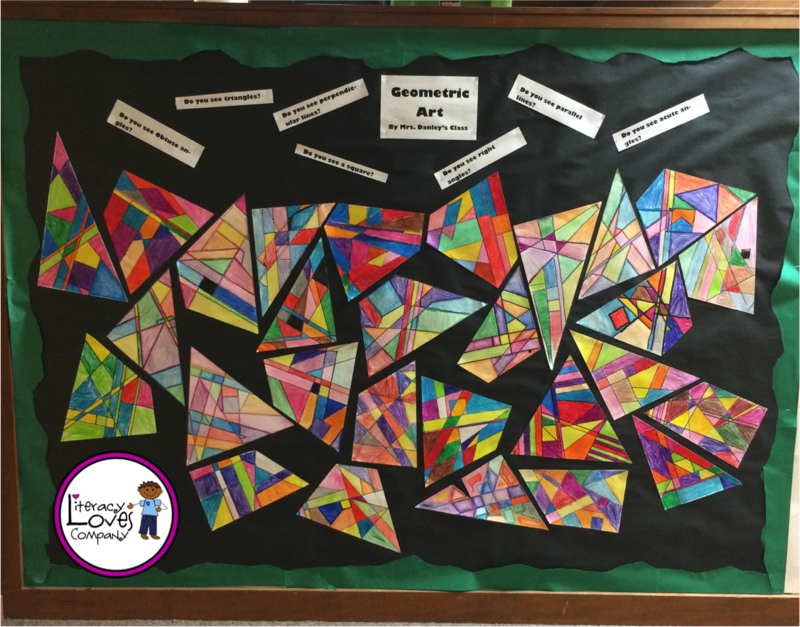 Today I want to share with you a couple of ways that I integrated art into my geometry instruction this last quarter. We were just at the beginning of our geometry instruction and were learning about lines. 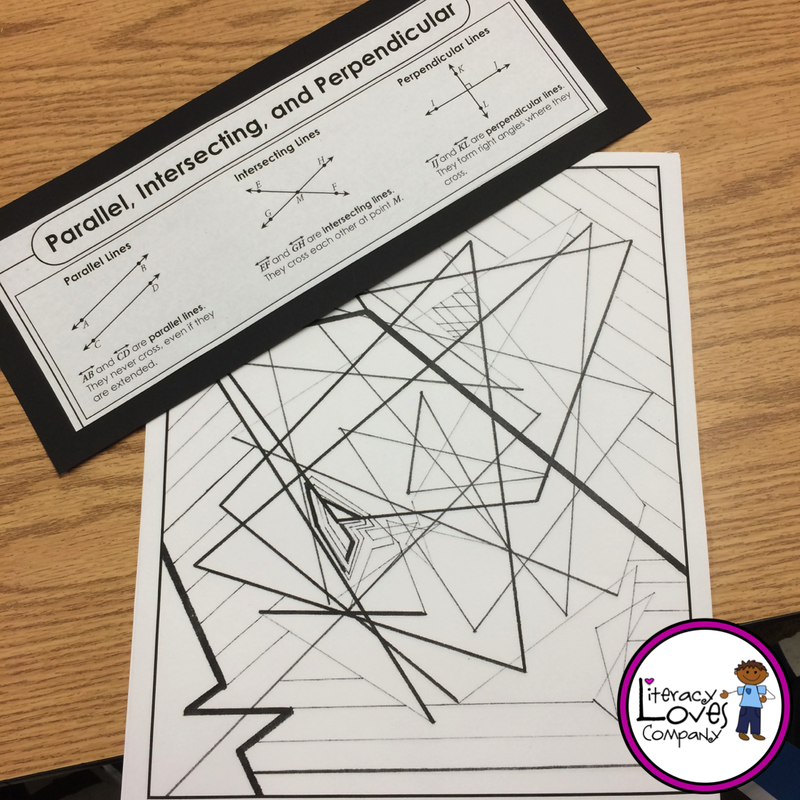 This day's lesson was about parallel, perpendicular, and intersecting lines. During my instruction, students took notes in their math journals and drew examples of each of the types of lines. I then paired them up and had them get out highlighters. 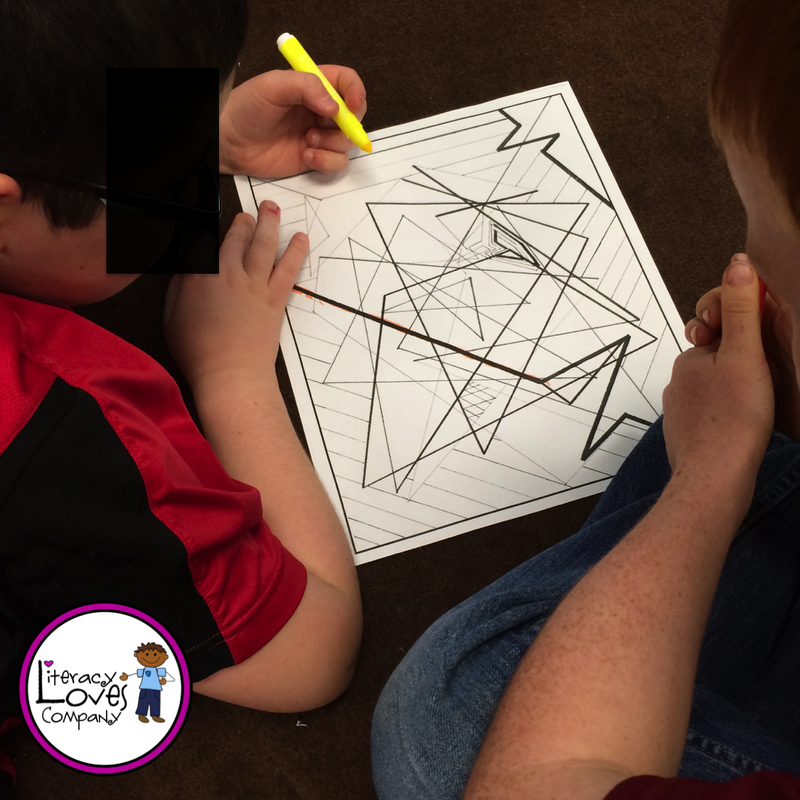 The instructions were to take turns finding parallel, perpendicular, and intersecting lines. I also asked them to locate right, acute, and obtuse angles. 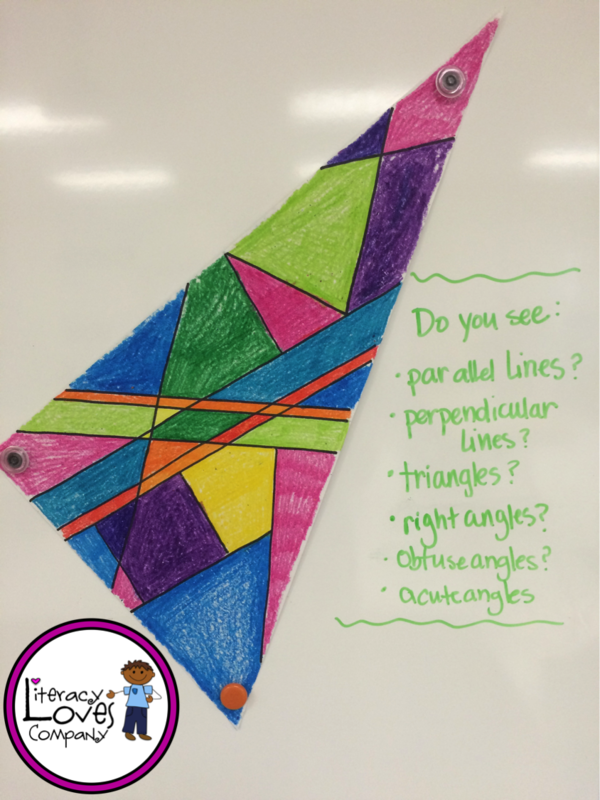 If you had already studied triangles, you could also have them search for types of triangles. Basically, students played an "I Spy..." game. 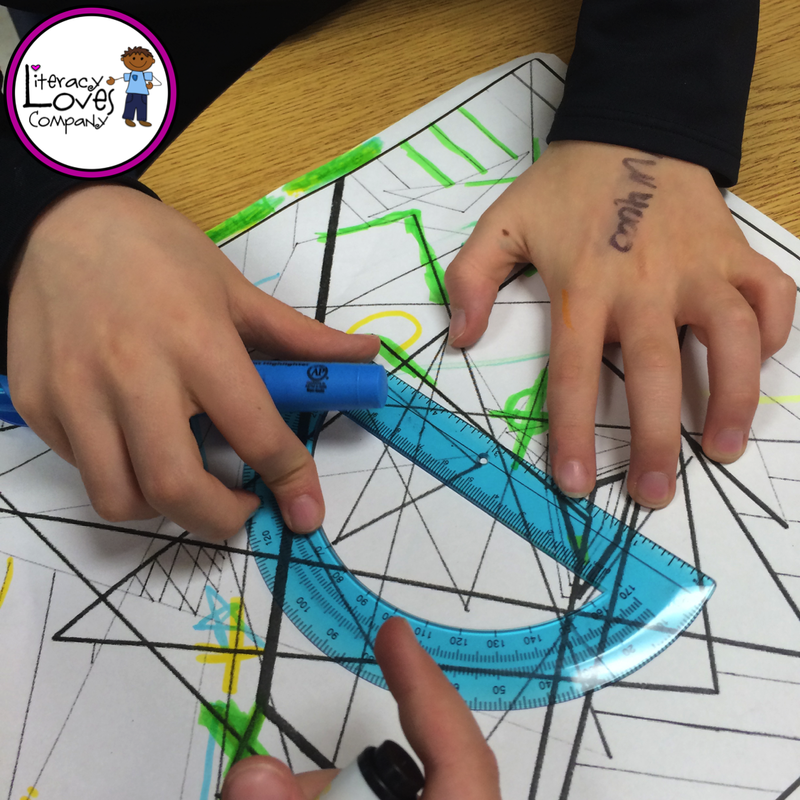 I handed out protractors for students to use as they searched for different angles. Students were quite engaged with this task! At the end of their work time, as a check-in, we met on the carpet and discussed which types of lines and angles were easiest to find, which were more difficult, and their conjectures about why. 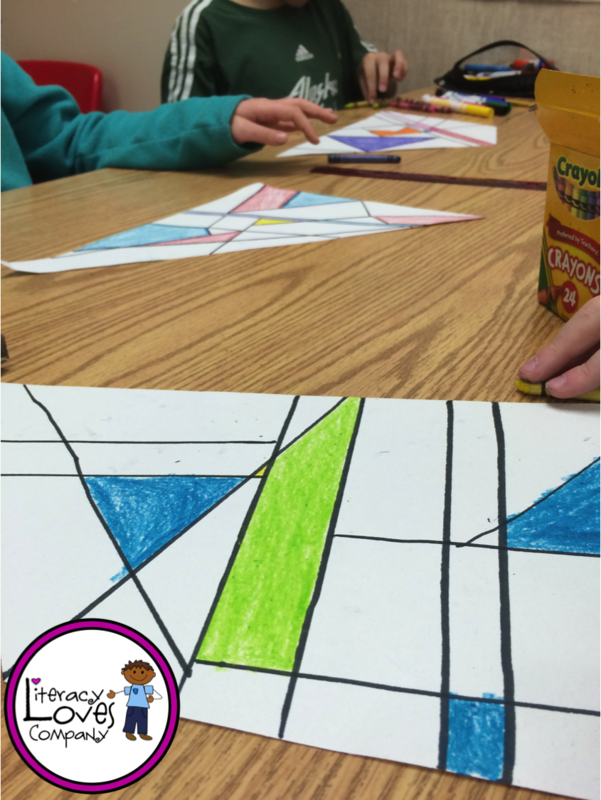 We usually have art on Friday so, in order to extend our learning of lines and angles, our art focus on that Friday was a geometric art project. I posted my example along with some questions that morning so that students would start thinking about the project and to build a bit of anticipation. Students were asked to get out crayons and rulers. 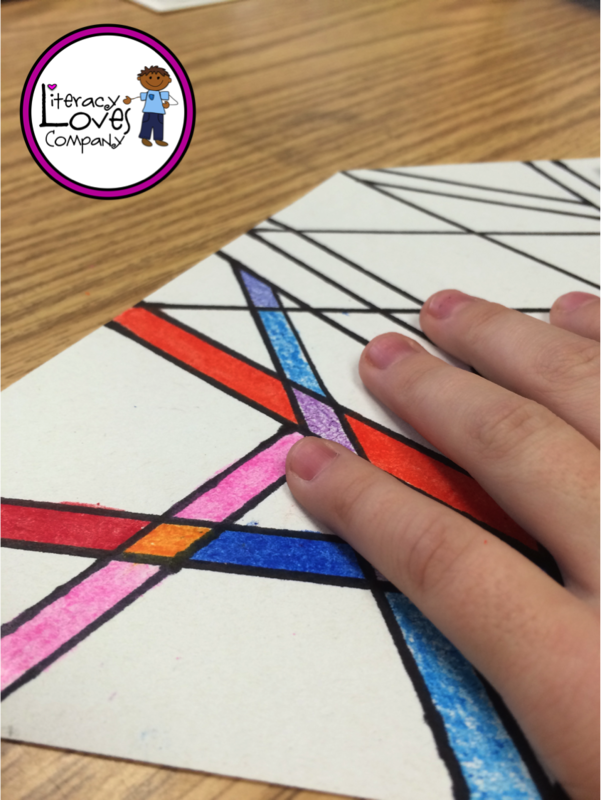 Not only was this an art project about lines and angles, but it was also a lesson in following directions, which some of my students are struggling with right now. As I gave verbal cues, students drew the type of line, angle, or shape I asked for. They used their rulers and Sharpie markers for bold black lines. We decided that a "line" would go from one side of their shape to the other. A ray would start on the page and go off one side, and a line segment would not touch either side. You will want to make this clear ahead of time. 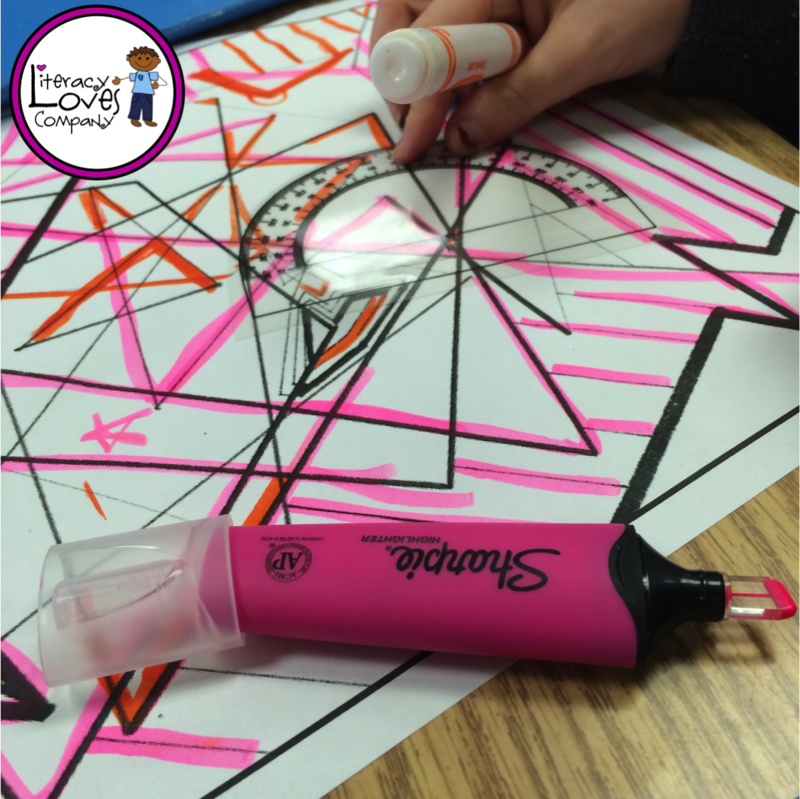 When the drawing of the lines and shapes was completed, students used crayons to color in their shapes, but any medium could be used: markers, colored pencils, paint. The directions for this phase of the project were that you could not use the same color to fill in any "adjacent" shapes, and we discussed what "adjacent" means. 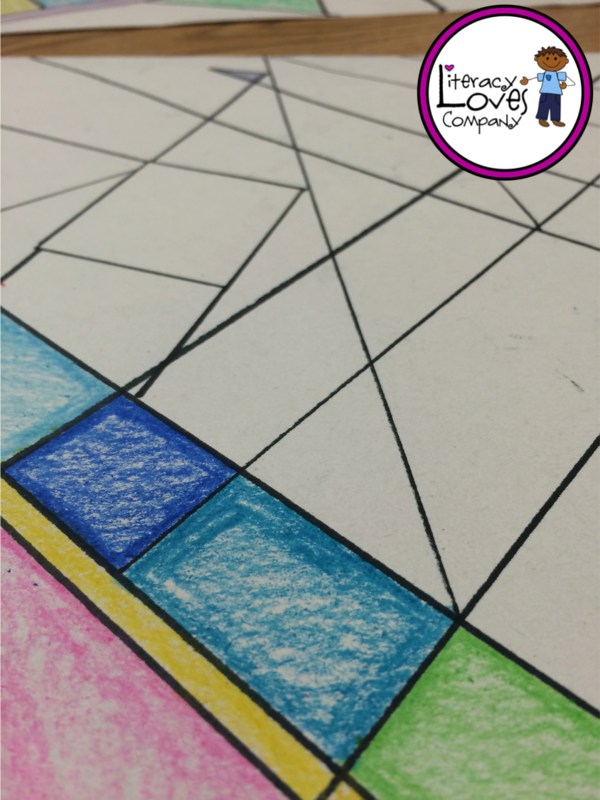 When the projects were completed, for a quick assessment of the project, students could share/exchange with their peers and try to find the different lines, angles, and shapes. 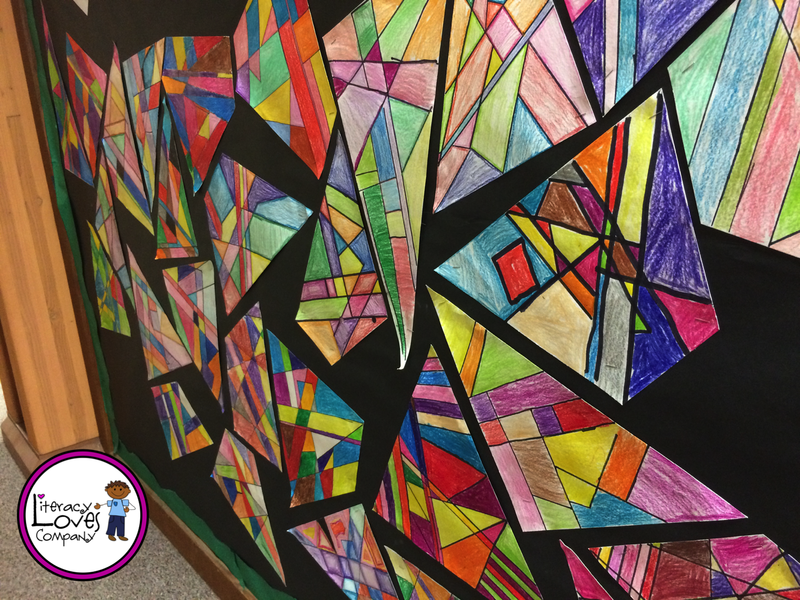 The completed art pieces were collected and I made a colorful bulletin board to display them. Looks a bit like stained glass, doesn't it? 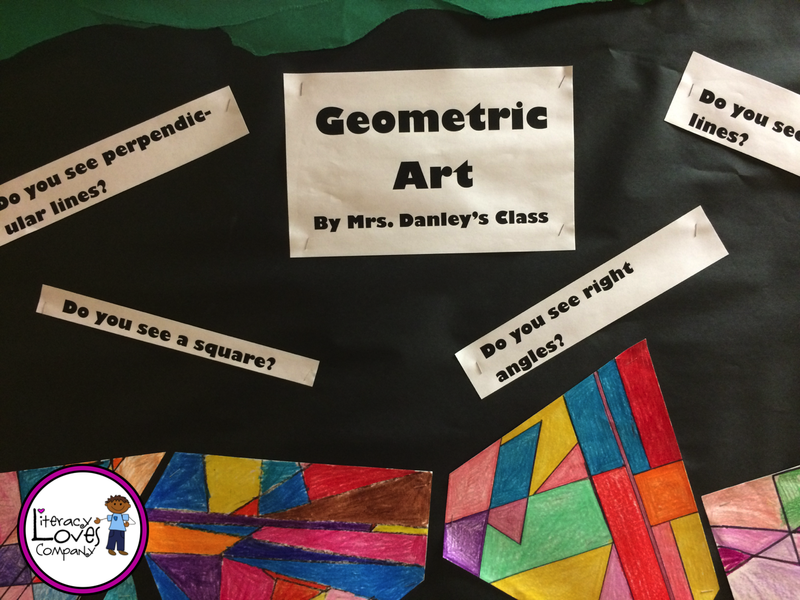 I like interactive bulletin boards, so I added questions to encourage students and parents who passed by to stop and interact with our art work. 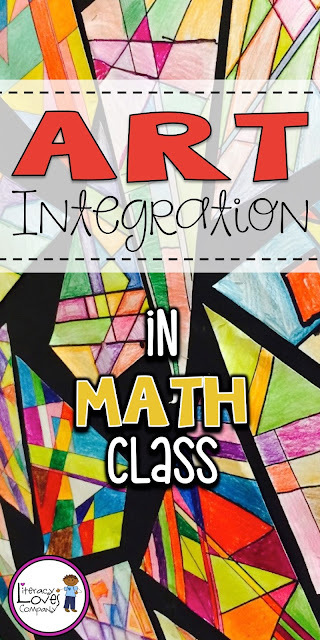 This ended up being a great math and art experience for my students and it supported my opinion that integrating art into math doesn't have to be painful! It helped my students build their math vocabulary, practice locating shapes and determining angles, and also introduced some new math words to my class. As an added bonus, students practiced the skill of following verbal directions. 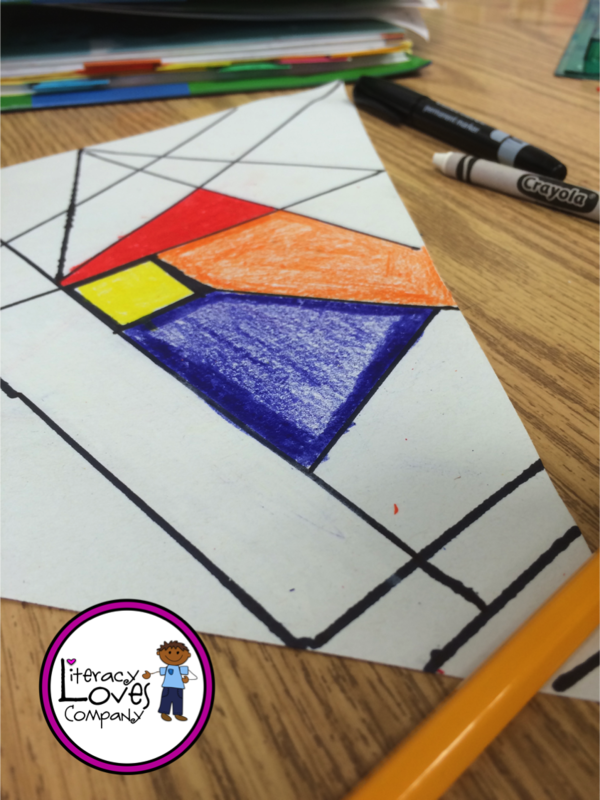 I hope that this has inspired you to add a bit of art to your math curriculum! If you are interested in more great ways to integrate art in your classroom, follow my Literacy Loves ~Art Pinterest board! Excellent crafts and and useful information. Hi there- where did you find the original line assignment that you googled? I would love the link. I just googled "geometric line art", clicked on "images" and it came up a few rows down. The link actually takes you to car interior website that doesn't even show the line art. Actually, I couldn't see any images on the website. I coped the image from the google images page, pasted it on a word document, and printed it from there. Now that we have finished our testing, I am going to do a lot of integrating art into my math lessons. My daughter does this all the time in the middle school classes she teaches. I can't wait! This sounds like so much fun! Thanks for sharing. Can't wait to try this with my students. Great idea! Just a few questions: how old were the kids doing this? What grade? How long did it take them to complete the activity? Thank you! Thank you! My students were 4th graders, so 9 and 10 years old. If I remember correctly we did the hunt on one day and the art project on another day, so 2 days. I love this idea. Do you happen to have a list of the instructions that you used? Thank you! I do not have a list of instructions except for the instructions detailed in the blog post.